After owning 2 C14s (2008 and 2010) and 4 FJRs (2005, 2008, 2013A, and 2014 ES), I think that is very good advice. 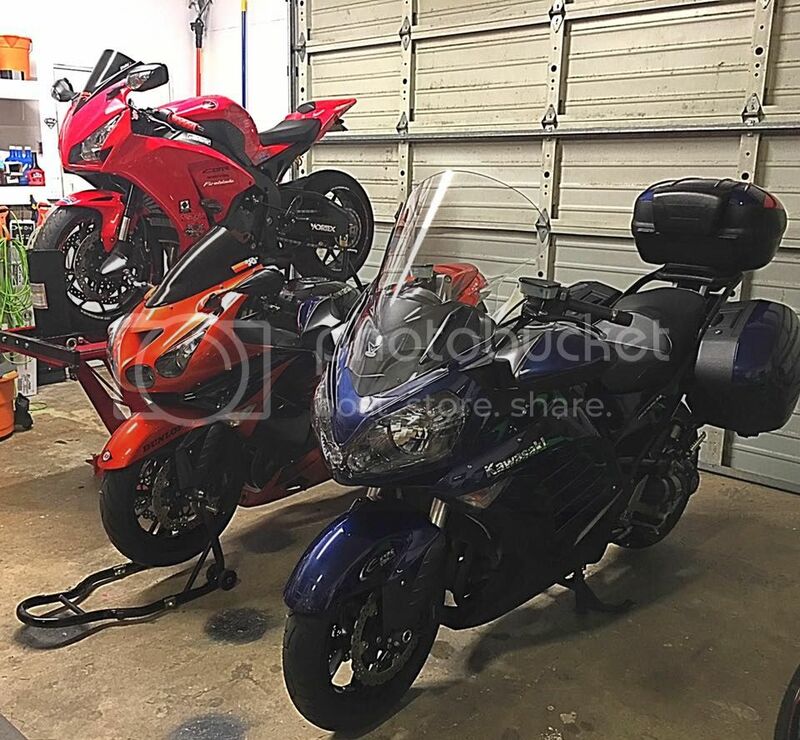 I have had a C14 and a FJR sitting side by side in my garage since 2007 and while the C14s match the FJRs very well when comparing like generations, the FJR has been in its 3rd generation since 2013 while the C14 is deeply stuck in its 2nd generation. My 2010 C14 has a Penske shock and ZX-14 fully adjustable forks, both of which are significant improvements in ride and handling but it still is not as good as the bone stock 2013A and 2014ES FJRs. The C14 is also top heavy in comparison to the FJRs and can be a handful at slow speeds especially when riding with a passenger. The C14 does beat the FJR is top end power if that is important to you and it also appears that even more power is available through out the rpm range if the motor is re-flashed (at a cost of about $375). I personally don't think its necessary on a touring bike, both the FJR and the C14 have more power than you can sanely use on public roads. Very well said mcrider, and I have seen how you ride that FJR, no slouch!. After sitting on the Connie it makes the FJR feel even lighter and smaller, but still a fun tourer. I can't believe it took Yamaha so long to add a 6th gear, the ones I rode were both still the 5 gear models and it really needed it. True, power and handling can always be maximized...if one wants. I think 375 for a Steve's reflash is ridiculously high IMHO. I got my C14 to have a more sedate ride, so I think I will leave the suspension and power as is to keep me from trying to ride it like my ZX-10. If I need scalpel sharp handling and wheelies I will just ride it, LOL. OP, if you ever end up in Moses Lake before you decide, you will be welcome to try mine. I can't believe it took Yamaha so long to add a 6th gear, the ones I rode were both still the 5 gear models and it really needed it. Whether the FJR really needed a 6th gear is still a subject of debate but it certainly is not a negative. However, the C14's 6th gear is far too tall (3.4:1) to be very useful, especially if you are trying to extend range in its relatively small 5.8 galleon tank. I get better fuel economy in 5th gear about 80 percent of the time, especially when riding double; into even a slight head wind; or up a slight grade. Obviously, having a overdrive 6th gear is great when going downhill or a enjoying a nice tail wind. Whether the FJR really needed a 6th gear is still a subject of debate but it certainly is not a negative. Agreed. I'm very happy that I waited until the '16 model year to pick my FJR up. Some may chalk the change to six gears to more a marketing gimmick than a substantive change, and while I’ll grant you it’s just a couple hundred RPMs lowering in sixth, it was enough a change (for me) and/or justification to push me over the edge that I was already teetering upon and finally pull the trigger on one. I took a '15 on a couple test rides last year, and the five-speed gearbox concerned me as I’d already sold a bike, an '08 Vulcan 900 Custom, in '12 because the revs were too high on the highway. The test rides suggested perhaps 5th as a top gear wasn’t too bad, but it didn’t seem ideal. Six gears on the '16, on the other hand, does, and I gotta say I'm really pleased to have it. Oh, and the LED lighting and slipper clutch upgrades for '16 are just icing on the cake. 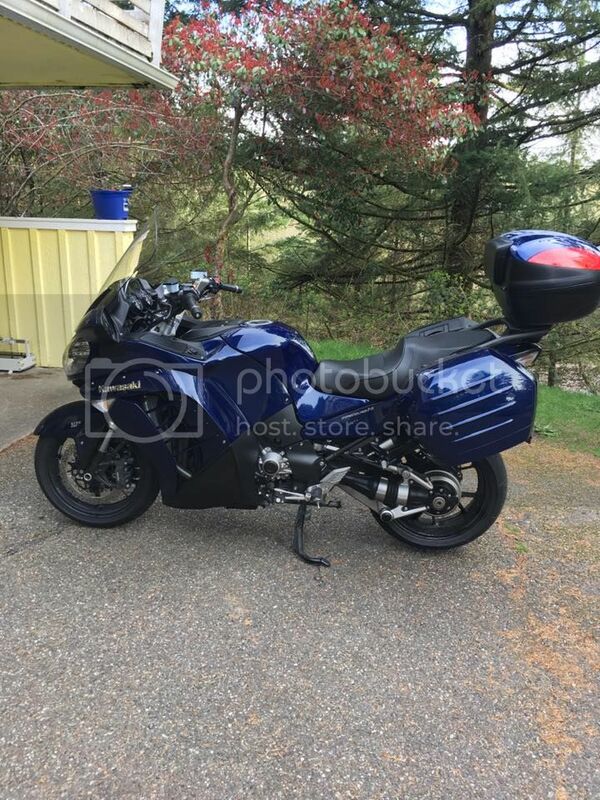 Btw, Mcrider, I'm curious: Why do you have two such similar bikes (the FJR and Concours) -- you mention, "I have had a C14 and a FJR sitting side by side in my garage since 2007." Both great bikes, of course, but I am curious why someone would have two such very similar bikes (as opposed to having for a second bike, for example, a cruiser or a naked sportsbike or adventure bike or a retro (e.g. Bonneville) or etc etc.? The C14 _is_ a bigass bike, and you have to take that into account. 6th gear is in fact freaking tall. I tach about 3600 at 80mph in 6th. But I like that. I use more of the gears on this bike than I have on any other bike. Sometimes I actually ride around in 4th rather than just passing through it. I think if weight is important to you the FJR is worth a test ride. I have not flashed my ECU because I haven't got many miles on my C14 and honestly it has way more pull than anyone really needs already, but I am certain I will have it done over this coming winter because why not? Good question...simple answer is that I am single...therefore I can. 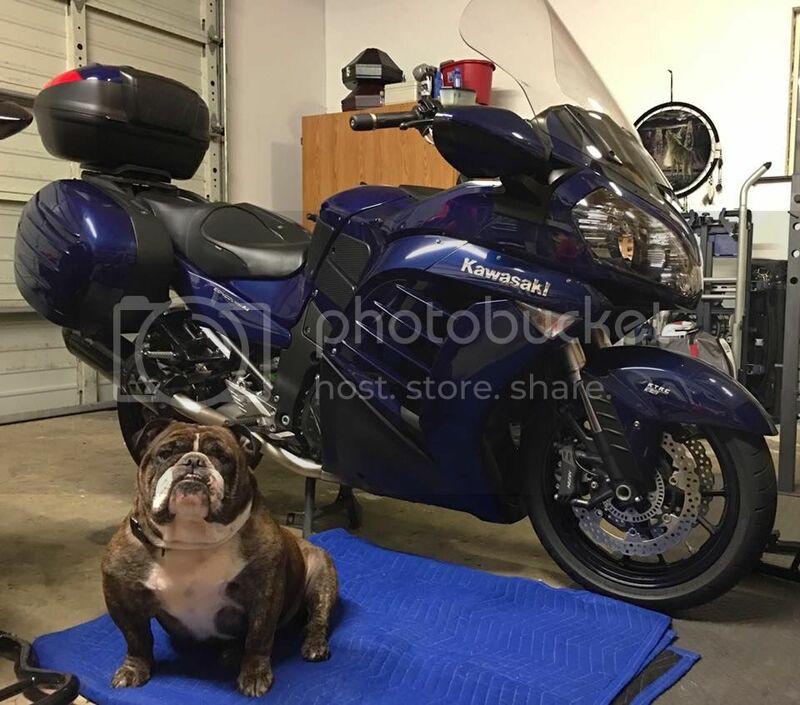 I normally have 3-5 bikes at a time since I seem to be more skilled in buying bikes than selling them and it is convenient to have a backup touring bike...and a adventure bike...sometimes a sports bike (last one was a ZX-14), and a loaner bike. My girl friend prefers the C14 for 2-up (and it has much larger hard bags), I prefer the FJR for solo, and I have a Super Tenere waiting for some future trip (last trip was to Bella Coola, BC and Hyder, AK). Bald Guy, Thumperpilot and RC65 like this. I have my Connie for sale on consignment, my Husky in the shop, my Triumph at the training facility. The only bikes in the garage were my Ural and a 1962 Yamaguchi. My wife walked into the garage and yelled "My car will fit!" dicate just one bike for me at a time. You guys with stables of bikes make me jealous. Word to the wise - keep the Blackbird, or you will wish you did. ZXtasy and Sentinel like this. I don't suppose anyone would be willing to let me try out their Concourse for a few minutes? You can ride mine and with its upgraded suspension and Laam seat its probably the best 2010 C14 you can find......but its in Kennewick. Ride Motorsports in Woodinville has a used one (black, I believe) on the upper floor that I'm sure they'd let you try out. Ask for Bill...a great salesguy, low pressure and helpful. Yup, I just bought one about a month ago. I ride a CBR1000rr, just sold my ZX14 and I love the Connie. Great bike very sporty handling. It took me a second to get used to the integrated braking, there are two different modes you can select as to how much braking force is applied when the system is activated, it comes on a little more abrupt then what my personal inputs are. I try to be as smooth as butter with all my input's and the integrated system will give you a bit of front end dive when it initially engages. Definitely not a deal breaker the bike is amazing. Huh. I ride a C14 and a CBR as well. Mines a 97 900RR. I don't even notice the brake linkage, but they reduced the link force on the 2015 bikes.